I can honestly say I don't have one finished room in my house. The past year and a half, I focused more on filling up the rooms with furniture instead of on any details. It's now time to go back and completely finish each room, and I'm starting with the dining room. It's mostly because I couldn't take that builder grade chandelier a day longer! 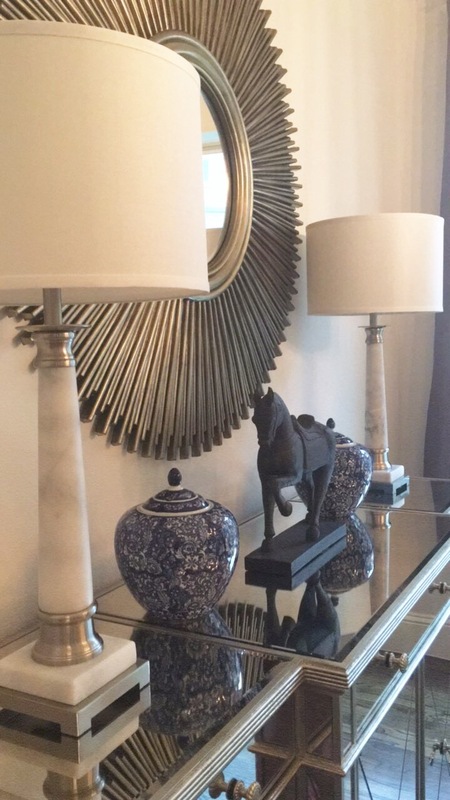 I also bought these new white marble lamps for the buffet for such a good deal on Overstock. I might add a bit of gold rub and buff to the silver areas later, but we'll see how the room turns out. 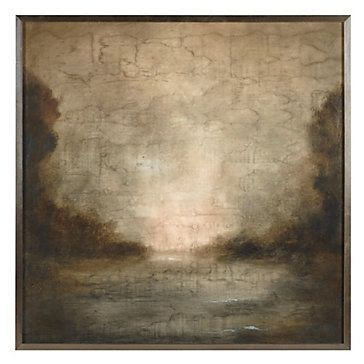 I say that because I just happened on this artwork from ZGallerie I absolutely love. I hate to replace the mirror because I like that too, but this is just so perfect to go with the room and the gray drapes. I've had my eye on a Restoration Hardware crystal chandelier for a couple of years, but the price made me hesitate. I also knew I was going to have to shell out a ton of money for someone to hang it. The dining room ceiling is about 20 feet high, which means we will need to use scaffolding. 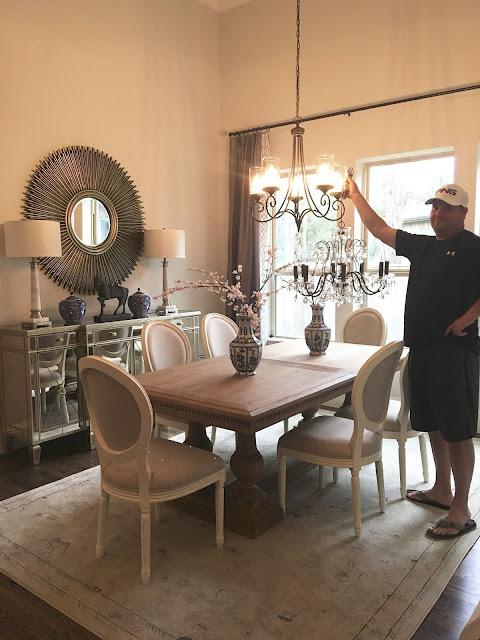 I did see a knock-off on Overstock of the same chandelier, but the reviews were terrible with people saying the entire chandelier needed to be re-wired. I found another one on Overstock from a more reputable company, but it was smaller with less crystals than I had wanted so I held off on buying anything. Once I decided I needed to buy something I went with the smaller chandelier. It came in last week and it's absolutely beautiful! I'm happy about having less crystals because I like my bling in small doses. I am still not completely sold on the size. The width is the same as what I have now, but it's quite a bit shorter. I knew that when I bought it, but I didn't realize the one long chain at the bottom would make up five inches of the height so it's even shorter than I thought. If I didn't have such tall ceilings it would be fine, but I'd prefer a longer chandelier. It's just sitting on my dining room table right now. I keep going back and forth every day about it. If I hang this one it's going to stay after paying for the labor! I made my husband hold it up to see how it would look. He looks thrilled, right? I also moved my bedroom rug in here to try it out. It would marry the gray and blue I have in the room, but it's just too light so I decided against it. I just have to try and talk him into helping me move it back to the bedroom now. That should go well. I decided to mock up my different design plans on an app. This is something I did when picking out furniture and was so easy. I could be in a store and paste it all together instead of having to go back to my computer. It's not the prettiest, but it gives you a quick idea. It also saves my husband's patience for the all of the other things I ask him to do every weekend. Maybe with gray chairs and a gray rug? The artwork doesn't come in for a couple of weeks so I have time to figure it all out! Oh my, our poor husbands. It's the same thing here weekend after weekend :) LOVE the new chandelier. I know the feeling of never being done....but you'll get there!